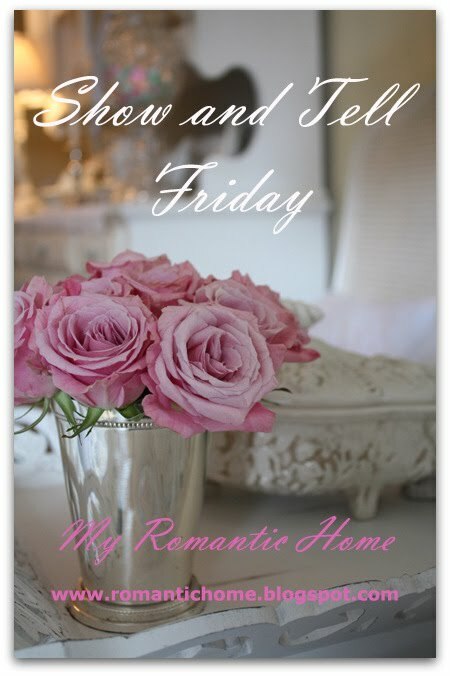 Welcome to Show and Tell Friday! I was super rushed today so I had to pull an old photo off of my computer to share. It was quite a day...my iphone died and I wasn't eligible for an upgrade until next month! I panicked a bit because I had a voicemail about an interview and I only got part of the message and I couldn't even call her back on my phone. I don't have a home phone anymore so I'm very dependent on my iphone! Luckily AT&T let me upgrade a month early so I now have a working phone. I was able to listen to the full voicemail message and I have an interview on Feb 5th! Fingers crossed that I get this one! I'm also joining in on Pink Saturday at "How Sweet the Sound". Hop on over there to see lots of PINK! Good luck on the 5th Cindy!!!! Old pics, new pics, it does not matter ~ we all still love coming to visit your beautiful site! I'm keeping my fingers crossed for you Cindy!! Gorgeous china Cindy, Good luck on your interview! Thanks so much for hosting Cindy! I'll be praying that the interview goes well! Thanks for hosting, Cindy! Glad you got lucky with that phone! Fingers crossed Cindy! Thanks for hosting! Good luck Cindy! Thanks so much for hosting! Good luck on the job Cindy!! Thanks for hosting! Best of good fortune dear Cindy! Speak it into existence. This is your year...I feel it. Thanks for hosting, I am all linked up and ready to party. Saying a little prayer for you Cindy for the 5th! Thanks so much for hosting! Best of luck with your interview Cindy. Thanks for hosting. Good luck on your interview and thanks for hosting! Thanks for hosting. Best of luck on the 5th. Congratulations and good luck on the interview! Thank you for taking time from your busy day to keep up the Show and Tell Friday tradition! Thanks so much for hosting your lovely linky party for us all, and good luck on your interview!I hope you have a wonderful weekend coming up with your family. Good luck on your interview, I'll keep my fingers crossed for you. Thanks for hosting! Good Luck on your interview! All the best on the job Cindy. I hope it is all you want and more. Thoughts will be going your way for an extra special job. A request... would you share how you store your china and linens? how is your Dad doing ? Those kinds of days can really frazzle you! Glad the phone issue is fixed =) Much luck on the upcoming interview. Have a wonderful weekend. Happy Friday morning to you! My DIY Children's Book with Audio was really fun to create and so I am here sharing it with you and your readers. Thanks for hosting the party once again. Have a great week! Just love vintage china. Have a few pieces. Broke my grandmother's china cocoa pot several years ago. wish I had it now for entertaining. Thanks for hosting! I love all the valentine's ideas popping up! Cindy I don't care what picture you put on here. It is always beautiful and I love seeing them over and over again. I will keep my fingers crossed, I sure hope you get the job. Hope you have a good weekend. Thanks for hosting and good luck with the interview. Keeping my fingers crossed for you! Good luck on your job interview Cindy! Just turn on that charm and show 'em your smarts girl! All the best in the interview Cindy. This is the one. I think your floral china is so beautiful. My Grandma had some just like that. I haven't seen any around like it since. Good luck with your interview, Cindy! I'm glad that AT&T were able to assist you with an upgrade!! Keeping my fingers crossed for your interview on the 5th. I so love all your vintage china. 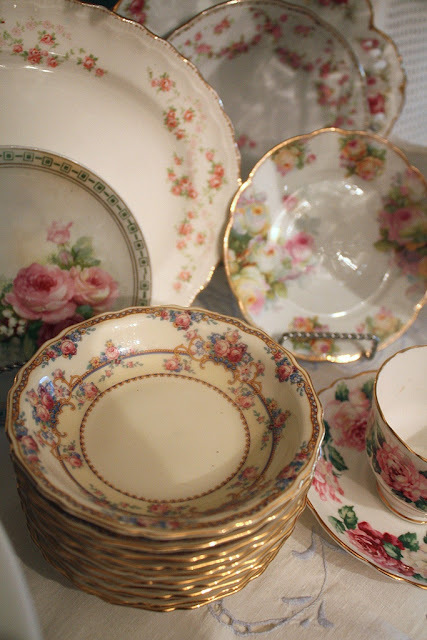 I collect vintage china as well. I love all the floral patterns.I especially love those bowls. Wish you all the best for your interview in February, Cindy! Look at you breaking out the hot pink and high heels! LOVE the new do! You look fabulous!